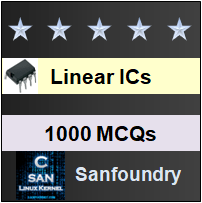 This set of Linear Integrated Circuit Multiple Choice Questions & Answers (MCQs) focuses on “Comparator”. Explanation: A comparator is some time called as voltage level detector because, for a desired value of reference voltage, the voltage level of the input can be detected. 2. Why clamp diodes are used in comparator? Explanation: The diodes protect the op-amp from damage due to excessive input voltage. Because of these diodes the difference input voltage of the op-amp is clamped to 0.7v or -0.7 v, hence these diodes are clamp diodes. Explanation: In a non-inverting comparator a fixed reference voltage Vref of 1v is applied to positive inverting input terminal and the other time vary in signal voltage is applied to non-inverting input terminal of the op-amp. 4. How the op-amp comparator should be choosen to get higher speed of operation? Explanation: The bandwidth of the op-amp comparator must be wider so that the output of comparator can switch rapidly between saturation levels. Also, the op-amp responds instantly to any change in condition at the input. 5. How to obtain high rate of accuracy in comparator? Explanation: High voltage gain causes comparator output voltage to switch between saturation levels. High CMRR rejects noise at input terminal and input offset (voltage & current) help to keep changes in temperature variation very slight. 6. How to keep the output voltage swing of the op-amp comparator within specific limits? Explanation: To keep the output voltage swing within specific limit, op-amps are used with external wired components such as zeners or diodes. 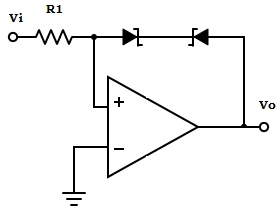 In the resulting circuit, the outputs are limited to predetermined values. Explanation: In zero crossing detectors, the output waveform is always a square wave for the applied sinusoidal input signal. 8. What is the drawback in zero crossing detectors? Explanation: Due to low frequency signal, the output voltage may not switch quickly from one saturation voltage to other. The presence of noise can fluctuate the output between two saturation voltages. 9. State a method to overcome the drawback of zero crossing detectors? Explanation: The drawback of zero crossing detectors can be in cured with the use of regenerative or positive feedback that causes the output to change faster and eliminate any false output transition due to noise signals at the input. 10. Name the comparator that helps to find unknown input. Explanation: Sometimes it is necessary to find the instant at which an unknown input is between two threshold levels. This can be achieved by a circuit called window detector. 11. 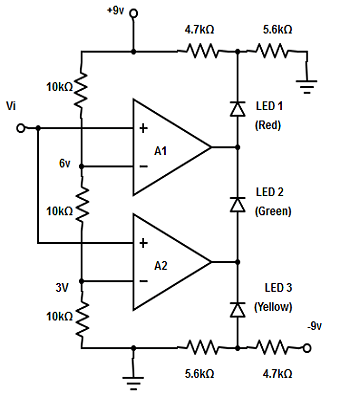 Find the instance at which the input can be fed to the op-amp in a three level comparator with LED indicator. Explanation: The input can be fed to the op-amp when the green LED glows, which is considered to be safe input that is when the input voltage is between 3v and 6v. 12. Find the output voltage at the point V2 from the given circuit. Explanation: The output of the zero crossing detector is differentiated by an RC circuit (RC>>1). So, the voltage at V2 is a series of positive and negative pulses. Explanation: A diode connected at the output of time marker generator circuit converts the sinusoidal signal into a train of positive pulses. So, these pulses are used in triggering the monoshot, SCR, sweep voltage of CRT, etc. 14. Which among the following is used to increase phase angle between different voltages? Explanation: Phase angle between different voltages can be measured using phase detector circuit. The corresponding voltage to be measured is converted into spikes and the time interval between the pulse spikes is measured, which is proportional to the phase difference. 15. For the comparator shown below, determine the transfer curves if an ideal op-amp with VZ1= VZ2=9v. Therefore, VO = ±(VZ+VSat) =± (9+0.7) = ±9.7 v.